Following a lead discovered in Scenario #1-11: In Pursuit of the Scoured Past, First Seeker Elsebo sends the Starfinders on an expedition to a planet that could have a connection to the Scoured Stars incident. Tasked with finding out whatever they can about the planet, and a relic believed to have landed there, the group must deal with a strange environment, and dangerous locals. Unlike similar scenarios, this adventure features a whole lot more than you’d expect, including the mysterious introduction of an important part of the Scoured Stars plot line, and some delightful moral dilemmas. Those of you who have played through #1-05: The First Mandate, will find that one of your boons might earn you an extra hint or two. Overall, this was an enjoyable scenario, that was very different from those that have come before. The difficulty defenitly ramps up in this scenario, which was a welcome change for us. The NPCs are all very interesting and cool. The investigation portion could have been fleshed out a lot more however. Interesting set up leading to the scoured stars. 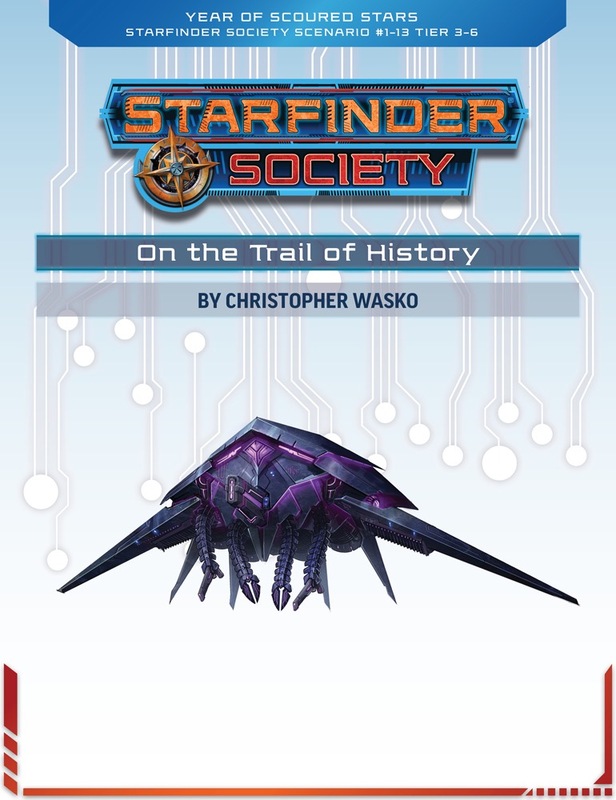 On the Trail of History is an excellent scenario that definitely increases the difficulty level from previous Starfinder Society scenarios. I ran this for four players at Subtier 3-4, and there were multiple encounters that left them walking a fine line between life and death--which is the kind of tension that SFS has been lacking. In addition, the plot and NPCs are really interesting, even if there is an investigative element that is overwritten given the context of the adventure. Overall though, this is a strong scenario and worth playing as part of the "Year of Scoured Stars" meta-plot. In a fairly routine briefing with Luzwazi Elsebo, the PCs learn that they'll be following up on a lead (discovered in # 1-11: "In Pursuit of the Scoured Past") to helping figure out how to bypass the golden shield that has trapped so many Starfinders in the Scoured Stars system. The PCs will need to travel to a planet out in the Vast called Icefront and see if a mysterious relic can be found. Icefront is thought to be largely uninhabited, but is home to an agricultural research station operated by Frozen Trove Labs. PCs who slot a particular boon will quickly get the suspicion that there's more to that research station than meets the eye. (unlike the previous "High Society Influence" boons from # 1-05, I thought the inclusion of Ykris here was a bit out of left field since he doesn't appear in the scenario and players probably won't even remember who he was). So far, this sounds like a pretty standard SFS mission. Things change when the PCs have a starship combat encounter with a mysterious ship on their way to Icefront. The combat is expected (any time PCs get to choose their ship, there's inevitably a battle), but what's exciting is that the enemy starship is *tough*. The resulting encounter is the closest I've ever seen to a defeat for the PCs during starship combat in an SFS game, and even the little twist at the end (the enemy ship having a self-destruct system) was great. I'm intrigued by the origin of the alien vessel, and it's a thread I'm looking forward to seeing develop in future scenarios. After getting into orbit around Icefront, the Starfinders will be contacted by a Dr. Monsylkis, the director of the Frozen Trove Labs research station. Monsylkis invites the PCs to visit the facility, and since they don't have any other clear leads on how to track down the relic, they'll presumably agree. The plot concept here is that the station is indeed up to nefarious ends (conducting illegal experiments for commercial exploitation), something that Monsylkis' has no idea about. From the amount of detail given to the station and the in-depth information about how the PCs can discover the truth, it's clear the writer intended this to be a major thing for the Starfinders to focus on. After reading the scenario a couple of times and running it, however, I still don't really know why. The PCs are sent there to look for a mysterious, ancient alien artifact, and don't have a particular reason to care if a corporation is doing some illegal genetic modification of food. At least in the game I ran, the players had no idea they needed to be actively searching for evidence while there. In any event, the PCs get kicked out by station security if they investigate too much or too well. Dr. Monsylkis gives them directions to the nearest band of Icefront's presumably-indigenous sentients, a race of bipedal lizard-like creatures with four arms named izalguuns. The PCs have a chance to aid a band of izalguuns in a battle against some massive slug/mammoth creatures and be invited back to meet their leader. I really like the clever writing here: based on their equipment, tribal society, and hunter-gatherer lifestyle, it's easy to assume that izalguuns are the typical unsophisticated "primitives" of so much first-contact fiction. But actually, izalguuns possess technology just as (or even more) advanced as the Pact Worlds; they just choose not to use it in order to live more in tune with nature! They even speak flawless Common, something that was definitely a surprise when my players heard it. There's some good opportunities for role-playing while at the izalguun camp. The bottom line the PCs will soon learn is that the izalguuns can give them information about the relic, but only if they persuade or force the researchers at the Frozen Trove Labs station to close up shop and leave--the scientists have (unintentionally) created an intrusive strain of plant life that is wreaking havoc on the local ecosystem. When the PCs head back to the research station, the final encounter of the scenario takes place. The Starfinders are ambushed by two waves of Frozen Trove loyalists: a few low-CR security guards followed by an interesting high-CR duo consisting of a dragonkin soldier and his bonded partner, a ryphorian mechanic. This was a near TPK when I ran the session, but it was within the bounds of fair play and was really exciting. I wouldn't want every scenario to push so closely to the redline, but a generally higher degree of challenge is welcome as far as I'm concerned. I especially liked that the PCs are watched and studied earlier in the scenario so that the ambushers can prepare custom tactics depending on what they notice. Once the ambush is overcome, the PCs can find Dr. Monsylkis (who had no idea of her subordinates' actions) and try to persuade her to leave, with various results depending on Diplomacy checks. In a nice touch, the PCs can also force her to leave at gunpoint by taking a point of Infamy. The conclusion of the scenario is also strong, as the PCs have to decide whether to reveal the izalguuns' possession of advanced technology to the world (giving a true and accurate report of their findings as explorers) or conceal the truth (in order to protect the izalguuns). It's a solid, believable moral dilemma without an obvious right answer, something I always appreciate in scenarios. Overall, there's a lot to like about On the Trail of History. The story is interesting, the combat encounters are tense and exciting, and there's lots of opportunity for role-playing and decision-making. I do think the middle section (the exploration of the station) wasn't properly integrated with the PCs' mission. I'm not sure what I think about another element of the scenario: there is an enormous amount of attention given to skill checks and skill check modifiers (some that persist throughout the entire session); on the one hand, I really liked the added detail and how various PC actions were accounted for and rewarded; on the other hand, it was almost too much cognitive load and too much to keep track of as a GM. I'm sure a good middle ground can be found between the two extremes. Anyway, it'll be fun to see where this storyline heads next. Well the metaplot is in full swing with 1-13. Clearly this scenario is not to everyone’s likings (based off of the previous reviews) but I (and I think most of the party) had a really good time with it the two times I GM’d it. First I’ll go over the good, then what I would have done differently specifically within the scenario, and finally I’ll give my take on starship combat in this scenario and as a whole in SFS. I thought the scenario did a good job combining interesting characters into the overall metaplot. Dr. Monsylkis was fun to roleplay as a sort of naïve scientist who doesn’t really understand everything that’s going on (and she doesn’t), and the transition from “low tech natives” to asking about starships really surprised the party. After a challenging starship combat (and more on this in the next two sections), the scenario had a little bit of investigation, some interesting combat, and a final combat that proved pretty challenging for one of my groups. While I’m glad that SFS hasn’t been a killfest (and intentionally so) so far in Season 1, it’s nice to start to see enemies (both stellar and terrestrial) that are starting to the test the PCs. I felt like the investigation component of the scenario left a little bit to be desired. There’s a lot that happens in a relatively short amount of time, and both of my groups seemed relatively content to go on the tour and then head out to meet the natives. Other than figuring out that Dr. Monsylkis’s “assistants” weren’t very friendly, there wasn’t as much interaction with all three major NPCs as I think the scenario author might’ve intended. And, while I know this is part of a larger metaplot of finding the hidden artifact, it was annoying for GM and players alike that there was absolutely no description given of the artifact the PCs were looking for – I know they wouldn’t find it in 1-13, but they didn’t. This is a carryover from 1-11 when the PCs find out there are artifacts that they’re looking for, only there’s no in-scenario description of what they actually are. From reading other reviews below this one, it seems like this scenario’s starship combat is more controversial than most (and starship combats are already relatively controversial to begin with). With the possible exception of 1-03’s starship combat, I think this starship combat was the most difficult starship combat in an SFS scenario so far – and the weapons on this one certainly hit the hardest. Both of the groups that I GM’d took significant hull damage, with one group limping along at around 15 hull points at the end of the combat – one more hit easily could’ve done them in. To our group this made the starship combat exiting because there seemed to be real risk involved, with players and GM on the edge of their seat to see if the PCs or the mysterious spaceship could land the final blow first! Of course, there was actually no risk at all. Had the PCs been defeated by the mysterious ship, the planet’s orbital defenses would’ve come around and chased off their assailants before their ship could be destroyed. This could, understandably, make everyone involved feel like the combat was a waste of time, but I wouldn’t go that far. I think starship combat puts scenario authors in a difficult position because the outcomes are seemingly so extreme defeat in starship combat, on the surface, results in either a TPK or a Deus Ex Machina situation because middle-of-the-road outcomes (PCs are boarded and must defend, taken prisoner and must escape, etc.) all fall well outside the range of what could be accommodated in a 4ish hour scenario. So what to do? At PaizoCon in one of the panel discussions on SFS, somebody (Thurston?) said they were trying to treat starship combat as more like a skill challenge going forward – positive outcomes might make parts of the scenario later on easier, whereas failures would make it more difficult. I like this approach and am interested to see how it’s implemented, because (again, understandably) losing a big starship combat should feel like it matters without necessarily killing everybody. While I think the pros of this particular starship combat (challenging!) outweigh the cons (doesn’t actually matter to the scenario), adding in that consequence (example: after losing the starship combat the Izalguuns are more reluctant to trust them due to their poor performance, PCs suffer a -4 penalty to social interactions with the Izalguuns or something) would make the starship combat seem like it mattered more. All in all, I think 1-13 did a fine job of putting together and engaging story with some challenging combats. I thought this scenario was definitely above average and even had some great moments, which is hard to do in a scenario that’s basically part 3 of 5 of the metaplot for the first half of season 1. The issues discussed above in the spoilers held the scenario back a bit, but I enjoyed playing the scenario and think the scenario’s issues were relatively minor, all things considered. Spoilers ahead! I feel the biggest reveal about this scenario is that it is terrible. There is nothing redeeming about it and there isn’t any point to it. Afterwards, you find out that the scenario makes all your big choices for you. Don’t worry that the space battle is too hard; win or lose it doesn’t matter at all! Oh, you get to the planet and would like to learn about the item you’re trying to retrieve? Too bad! After finding out that I couldn’t side with the scientists I just gave myself my third infamy and removed my character from play and was done with the pointless scenario. I honestly feel like Hans Moleman locked in the quickie mart and when Apu comes back he wants his 4 minutes of his life backback. Only problem is this took hours to suffer through. I have to say I'm really into the ongoing storyline. Excited to play 1-11 and 1-13. Any chance map spoilers are available? Due to a lot of differing factors, we had to include two starship scenarios in this month. It was part of our 'growing pains' to transition into two scenarios per month. While I understand starship combat isn't everyone's cup of tea (personally I really enjoy them) you can expect us to avoid having two starship scenarios in a month from now on. When is this supposed to be available? I'm not seeing a date anywhere. It is already out. I have my PDF for it.